It amazes me how expensive laundry detergent is. What is even more amazing is how much fabric softener is. A few months ago, I started researching alternatives. It had to be something that would not fade our clothing, since we tend to wear a lot of dark colors. It had to be something that didn’t cause reactions to my husband’s sensitive skin. Finally, it had to be something that didn’t cost a small fortune. I found my solution. Yup. That’s it. 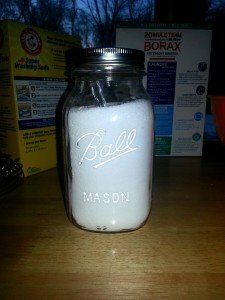 Mix the three ingredients in a mason jar or other container. Add two tablespoons per load. I put it right into the laundry detergent slot in my washing machine. I have a high efficiency washing machine and have had no problems with this detergent. It costs me about 6 cents per load, compared to 21 cents per load for the All Free and Clear I was using. It does an amazing job getting stains our of our clothing without pre-treating. What about fabric softener? The stuff I was using was bothering my husband’s allergies. I wanted something that didn’t make the clothing smell flowery. I just wanted something to keep the clothes soft. My solution? White vinegar. I just pour it into the fabric softener thingy (the technical name for it, of course) in my washing machine. I promise that the clothing will not smell like vinegar once they are dry. The clothes just smell clean. I have also stopped using dryer sheets. I purchased a set of wool dryer balls . Yes, they are more expensive than dryer sheets, but they dry my clothing about 25% faster which lowers my gas bill and I don’t have all those dryer sheets to throw away. They do a great job eliminating wrinkles from our dress clothes so there is less ironing wearing wrinkled clothing. I have been using this system for four months now and am really pleased with the results. I’m never going back to the old system again. By the way, in four months I have used about three batches of laundry detergent. 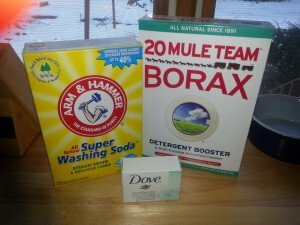 I still have over half a box each of borax and washing soda, so the boxes last a long time. Great idea! My daughter has sensitive skin so we end up paying extra for a brand that doesn’t bother her. Also, I bet those crazy couponers would be able to do this for free. Jeff has sensitive skin and has not had a problem with this laundry soap. I also make my own body wash which will be a post in the near future. So much cheaper than the stuff at the store. I’m definitely going to try it. I’d also be interested in seeing the recipe for the body wash. I seem to go through it so fast and it gets expensive. You can’t always wait for a coupon or a sale when it comes to body wash. I love those kind of days! Good job on the garden. I’ve been making my own laundry soap for 4 years now. The only thing I’d add is some color safe bleach for Lulu isn’t affected by it. The homemade laundry soap does a great job, but I found my clothes over time were looking dingy. (Honestly, I think it was from all the dirt the girls would get into) but I added a homemade recipe for color safe bleach and it’s made a world of difference. 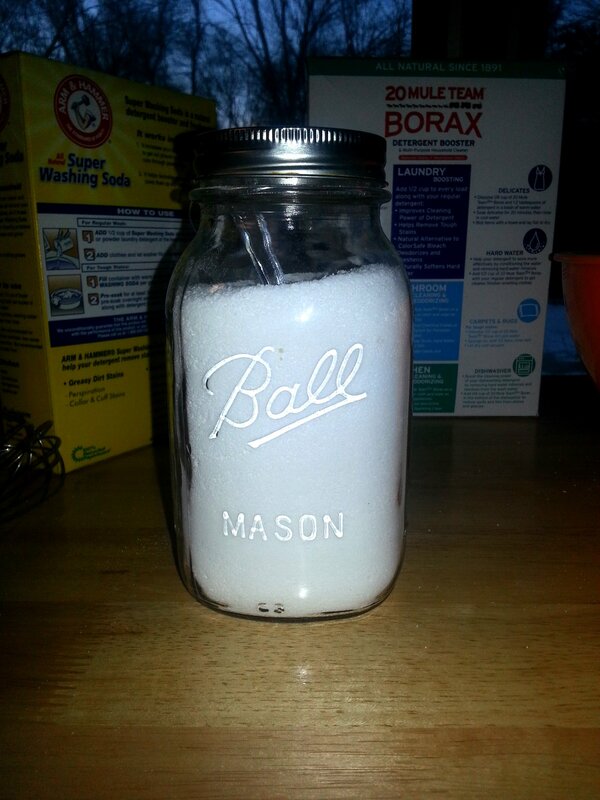 Mix 1 cup of Hydrogen Peroxide with 1/2 cup Lemon juice and 1/2 cup white vinegar into a 1 gallon jug. Then fill the rest of the jug up with water. I use 1 C per load. It’s good stuff! You’re so funny, I laughed at the thought of you jamnin/dancin and singin to Bon Jovi! Muah! Thanks for sharing the color safe bleach recipe! I’ve found that the white vinegar in the rinse cycle has helped keep the whites bright but I think I’m going to try your recipe to see what happens.